1) This is sick, but hilarious. It was easy to get a kick out of something as blatantly incorrect as this book. In fact, my current marine biology students enjoyed it quite a bit. Those riled enough suggested file #13. 2) Don’t sweat it. A minority remarked even though the book has glaring errors, none are worth getting too fired up about. Kids are resilient, and misconceptions learned that young are easily unlearned. 3) What an opportunity! Several also remarked that this book is a valuable potential lesson to hold on to. Keeping the book as a media literacy lesson is the best answer. In fact, this was definitely Delaney’s first favorite book. She still loves to have this one read to her. I’m not bad, but her mommy reads this one like a champ. Find a small child. Any child will do. No matter how far you have to look, find a kid and buy this book for them: Over in the Ocean in a Coral Reef. This book was written by Marianne Berkes and illustrated by Jeanette Canyon. I know little of the history of the creation of this book, but it is a masterpiece. Not only is it refreshingly accurate, and written in a fun and lyrical way, it is illustrated so beautifully that it makes me want to go buy clay. Seriously. Take it from a discerning dad who teaches marine biology- this is a fantastic book to read with a toddler. The book called out to my wife and I from a shelf in the exhibit hall of the NSTA (National Science Teachers Association) national convention in St. Louis just before our babe was born. The book came in two forms and we bought both on the spot. One is a thick board book that we figured she could have her way with, and the other is a paperback that contains more information at the end on the creation of the polymer-clay art that adorns each page. When looking at any of the pages here, keep in mind these things… every illustration: clay. Illustrate the riot of color and complexity of a coral reef… in clay? Absolutely. This is a serious work of art in my opinion. The ocean looks like Vincent’s Starry Night, and the lyrics (which correspond to music in the final pages) are quite fun. And to think- this book is a “numbers” book as well. Hard to compare to the previous book. Over in the Ocean truly builds the counting exercise into the structure of the story in a very organic and engaging way. In Over in the Ocean, parrotfish “grind,” clownfish “dart,” stingrays “stir,” pufferfish “puff,” dophins “jump,” angelfish “graze,” needlefish “skitter,” grunts “grunt,” and seahorses “flutter.” The octopus has eight tentacles. Parrotfish grind coral. Stingrays stir in sandflats. Emperor angelfish look exactly like emperor angelfish. Bluestriped grunts, both mommy and babies look precisely and act exactly like Haemulon sciurus– just ask my marine biology students. Enjoy this book. Enjoy the proud scientific accuracy. Enjoy the gorgeous art adorning each page. But perhaps most importantly, enjoy a book that is an interdisciplinary dive onto a coral reefs for kids. Previous Article← Attack of the Septapus -or- Why are you doing this to my kid? I have enjoyed following this story. As a parent of 2 young ones (now 6 and 3.5 yrs), I find I can relate. The best books we have for our kids are the ones we chose ourselves, or those recommended by close friends who are elementary school teachers. For the teaching about nature side, if you haven’t already, check out “Monkey Puzzle”, “Sharing a Shell” and “Snail and the Whale” by JULIA DONALDSON. She has written a ton of great stories for kids and the illustrations are super too. @Nadine, hey thank you. We are all such unique individuals (even at that age) aren’t we? Your comment about the best books coming from close recommendations makes me think about a discussion I had the other day about use of “rubrics.” I think such scoring guides are terribly important. I would argue that done well, they are a better teaching tool than even an assessment tool. That said, printing a rubric from some online free service and copying it directly for class seems similar to purchasing books online by the title, cover page, and one short review. Sometimes you find a good one, many times, you find a turd. Anyway- bringing it back, thanks for the tips on these other books. Considering the fact that you can stand to read through the words I tap out here from time to time, there is a good chance I might just love those books as well, huh?! In our fast-paced world today, it seems we are often in a rush, and things can fall between the cracks. As the old adage goes “haste makes waste.” The” Numbers” book in your “Septapus”blog is a good example. Wait! Maybe it isn’t an example, since it doesn’t seem like anybody even cared on that one! 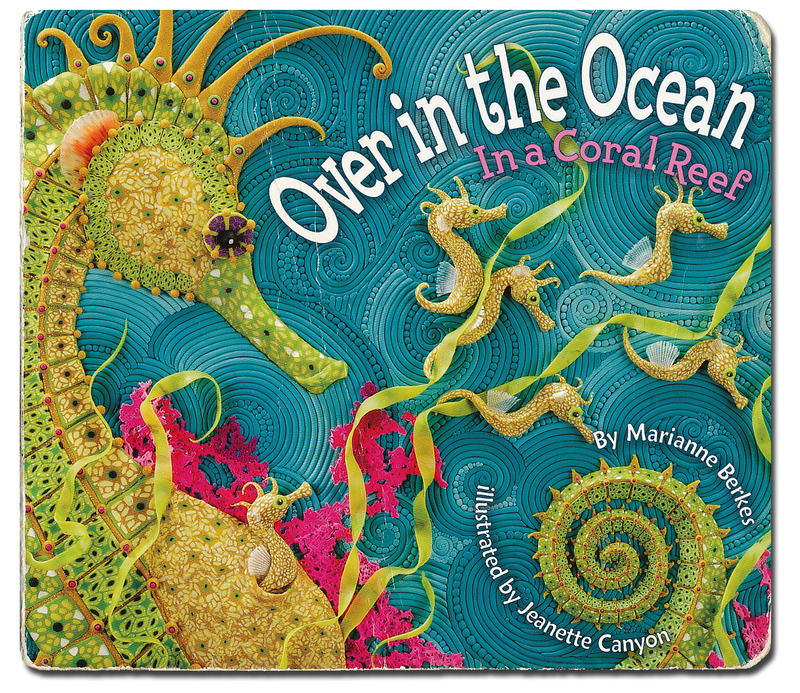 It took illustrator, Jeanette Canyon, over a year to complete her amazingly accurate clay creations for “Over in the Ocean, in a Coral Reef.” And as the author, I did about 22 revisions, believe it or not, with my editor, for that little book for pre-school kids, before Jeanette even started on the artwork. “Over in the Jungle, a Rainforest Rhyme” which was released in 2007. Lots of wonderful rainforest fauna and flora to count and learn about. You can see it on my website at http://www.MarianneBerkes.com. along with my other books, which are called “creative non-fiction” Hopefully teachers, parents and kids are finding them entertaining as well as educational. Enjoy!